Le Blog de Frivole: Travelling and Tatting - Travelling and Meeting! 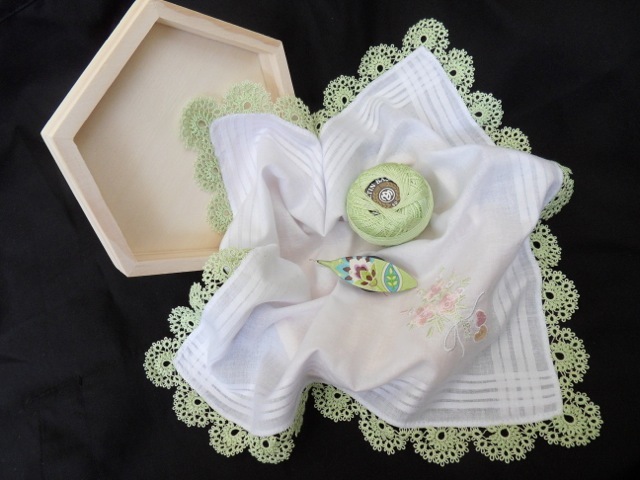 Travelling and Tatting - Travelling and Meeting! It's amazing what you can accomplish in the hours you are stuck sitting on a plane or waiting at the airport. 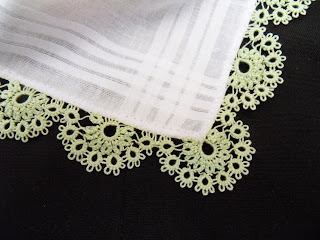 I started this edging at the beginning of our holiday and by the time I got back, the tatting was all finished and I even had it half sewn on (had to stop when the very cheap needle I had from a hotel sewing repair kit broke!). This morning I completed the sewing and here it is. I chose a one shuttle edging as I find that extra easy to carry around and work with when travelling. This is from a Mary Konior book and is called "hedgehogs". I'd been wanting to tat it for a long time and finally found the right project for it. It is actually a vintage edging that she has reproduced in her book so I suppose, not a Mary Konior design as such. 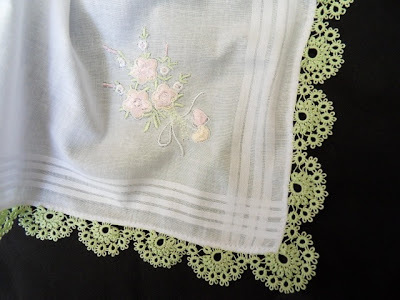 When I started tatting it, I didn't like the long threads that resulted when carrying over to the next motif but then decided that I would sort it all out at the sewing stage. 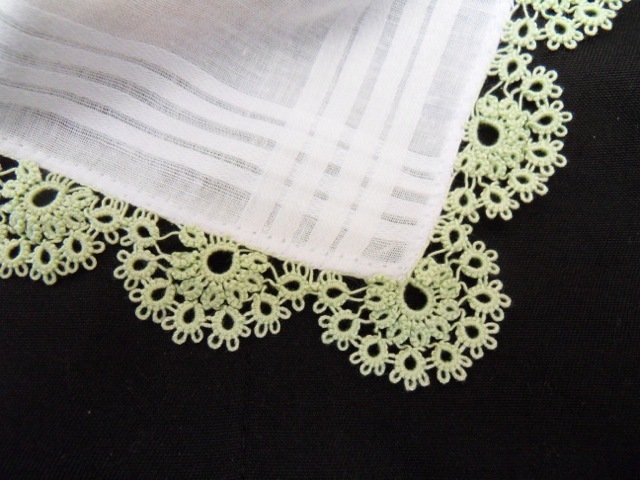 So all the floating threads are tied in to the sewing and are not visible on the finished hanky. It is tatted in Altin Basak 50. I do like that softer thread for handkerchiefs. I find it to be similar to a size 40 and fine enough for an edging. 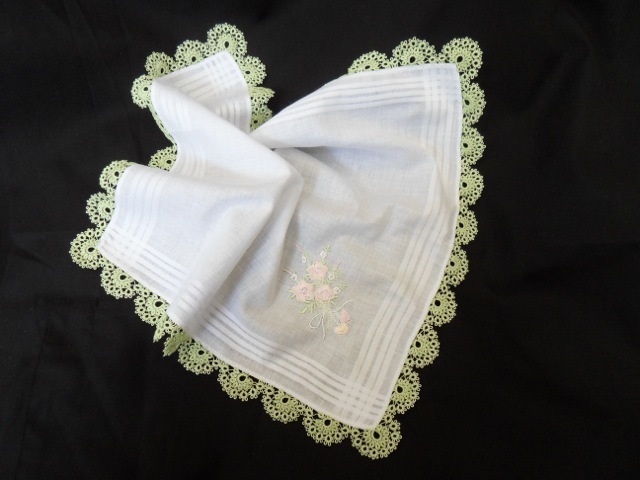 for the embroidery on the handkerchief. Amazingly, I even managed to also complete this pink edging I had started a while ago (but that will be for another post). I got to meet Fox of Tat-ology! I wasn't sure all the stars would align and we had very little time on our tight travelling schedule but I was so pleased we managed to get together, even for the short time we had. It was really great to have a tat and a chat with her. I only wish we could have had more as there was much to talk about and I would have loved to spend more time tatting together. I hope you all had a terrific summer too and got lots of tatting done! Beautiful edging, well done on getting it done while away. I have just packed up some tatting to take to Cyprus with a comment from hubby that I am weird taking work with me on holiday. How lovely to meet Fox and to have a little while together I read all about your meeting and her tatting thanks to you has vastly improved. Tatting isn't "work"!! Tatting is pleasure. I always take some away with me.... anywhere really! Wishing you a great holiday Margaret. How lucky you both were! Wish we could have met! Next time for sure! Beautiful edging with a funny name! Wow, that's so beautiful. Love the delicate colour. Which book of Mary Konior was the pattern in? Hi Anne, it's in the book called "Tatting Patterns". I have also saw a pattern like it in a Victorian period pattern book too. you did lovely work and fun color. Your embroider is wonderful too love it! Ah yes, "Lace-Lovin' shuttle", one of the prettiest, isn't it just? I'd make that edging again, in spite of the long floats... or maybe I'll have to find a way of making it without the floats, I'll have to get my thinking hat on!